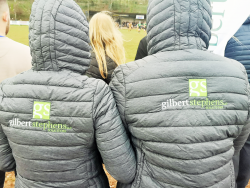 Gilbert Stephens Solicitors was delighted on Saturday 9th March to host guests at the Crediton RFC Players Reunion Match. 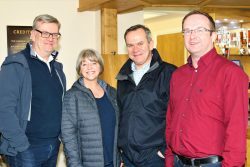 A wide range of local businesses and the Lord Mayor of Crediton and his wife attended pre-match hospitality for the exciting top-of-the-table clash between Crediton RFC and Sidmouth RFC. Gilbert Stephens has been a long term supporter of Crediton RFC and sponsoring this Players Reunion Match was the perfect opportunity to celebrate the history of the club, with previous players attending and supporting on the day. Marcus Quick, Wyatt Loake, Conall Ryan, Judi Thistlewood and Dana Mulligan represented Gilbert Stephens on the day and got stuck in to the spirit of the game from the sidelines. Gilbert Stephens was responsible for awarding a prize to the Man of the Match. Mark Lee, who was also celebrating his birthday, scored the try that brought Crediton into the lead. He was presented with a crate of beer and cider, courtesy of Gilbert Stephens from local brewers Hanlons Brewery and Sandford Orchards. 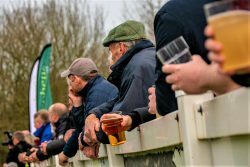 The Players Reunion Match saw Crediton, fondly referred to as the ‘Kirtons’ by its fans after an archaic name for the town, take on Sidmouth Rugby Club. The match was fast paced and the teams were a close match, but in the end Crediton secured a hard fought victory at 18 v 10 and established themselves at the top of the league table. Many past players and connections of the club attended, with former players sharing their stories and a compelling speech by the club’s Chairman Colin McKenzie. 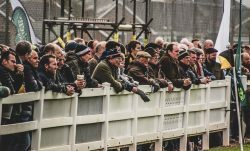 Eddie Trick, President of Crediton RFC, said, “It was an amazing day, with a great atmosphere from a crowd of around 400. 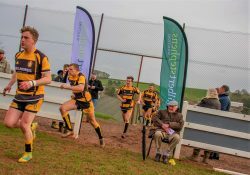 We were delighted with the result for Crediton, it was a truly marvellous game of rugby. The match reflected really well on our level of rugby, and for a small town we are very proud of the quality of play and the level of support for the match. Gilbert Stephens was proud to be match day sponsor for this special event in the club’s calendar and was honoured to share the day with guests, club members and players. 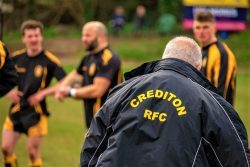 To find out more about Crediton RFC and to follow their progress, take a look at their Facebook page @creditonrfc or website http://www.pitchero.com/clubs/crediton.